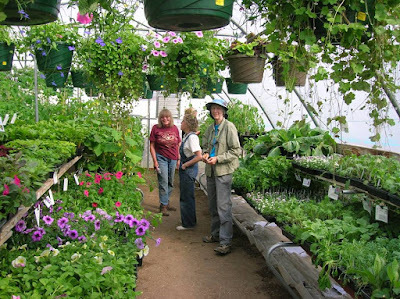 Volunteers help out at last year's plant sale. The Georgeson Botanical Garden annual spring plant sale will take place from 10 a.m. to 2 p.m. May 14. The Georgeson Botanical Society will host the sale at the garden. The sale will include annuals and perennials, including shrubs and trees, flowers, vegetables, herbs, and fruiting plants, such as currants and gooseberries. The plants are grown by volunteers in the School of Natural Resources and Extension greenhouse on West Ridge. Members of the society may shop the sale from 6 to 7:30 p.m. the night before. If you’re not a member, you can sign up on the spot. The society supports summer positions and other projects at the university's research and outreach garden. For more information, contact DiCristina at kmdicristina@alaska.edu or 907-474-6921.